Good day lovely readers! 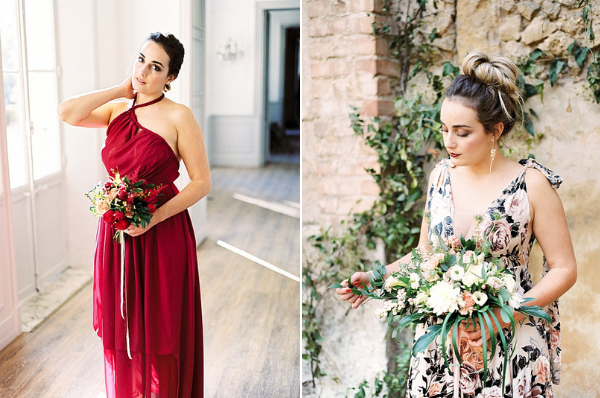 Today we are exploring the South France for this elegant Aurelie Mey Bride wedding inspiration shoot, organised and decorated by Amélie from Despinoy Wedding & Events. 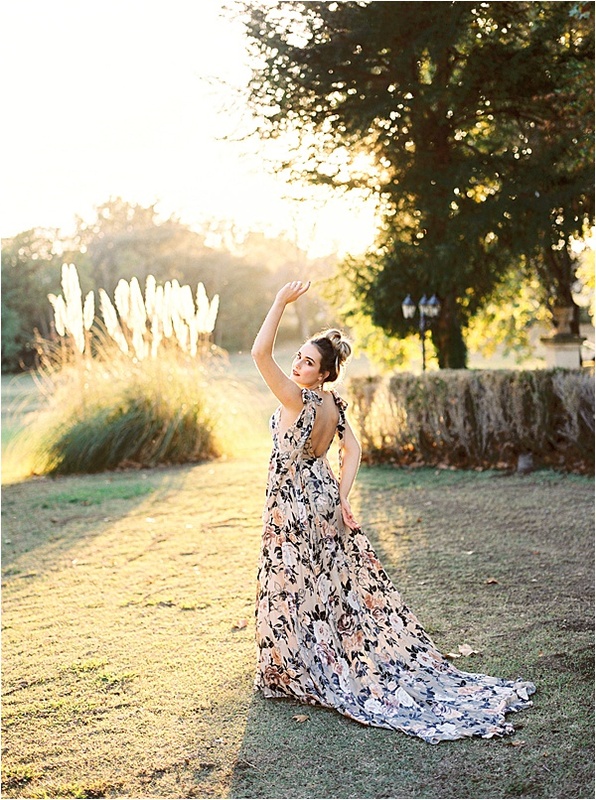 There’s so many reasons to love this creative shoot, captured by Iliasse Photography. Combining the delicacy and simplicity of Japanese culture, it’s utterly delicious and inspirational. 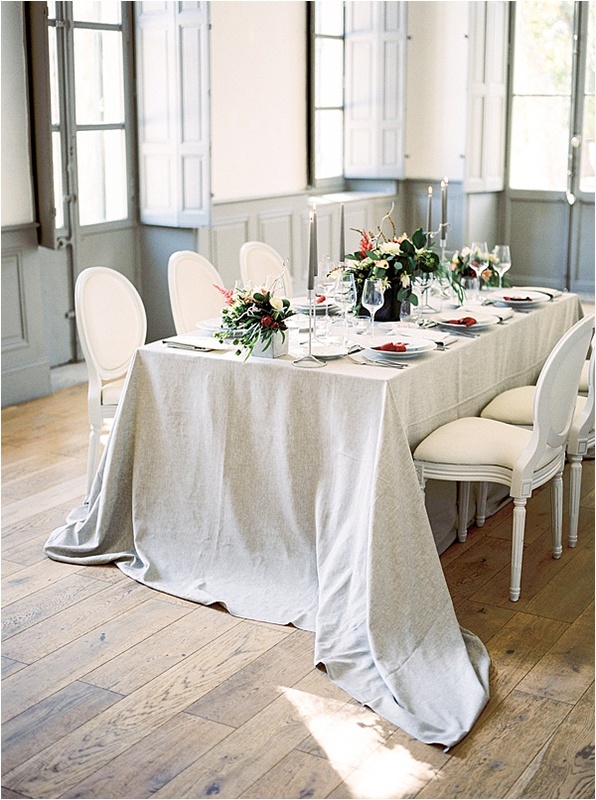 The venue for the shoot is the stunning La Bastide de Toursainte. Despinoy Wedding & Event gathered a team of very talented suppliers to showcase their work, and most importantly to demonstrate how fantastic the venue can be. So without further ado, Amélie will now walk you through the shoot. Enjoy! 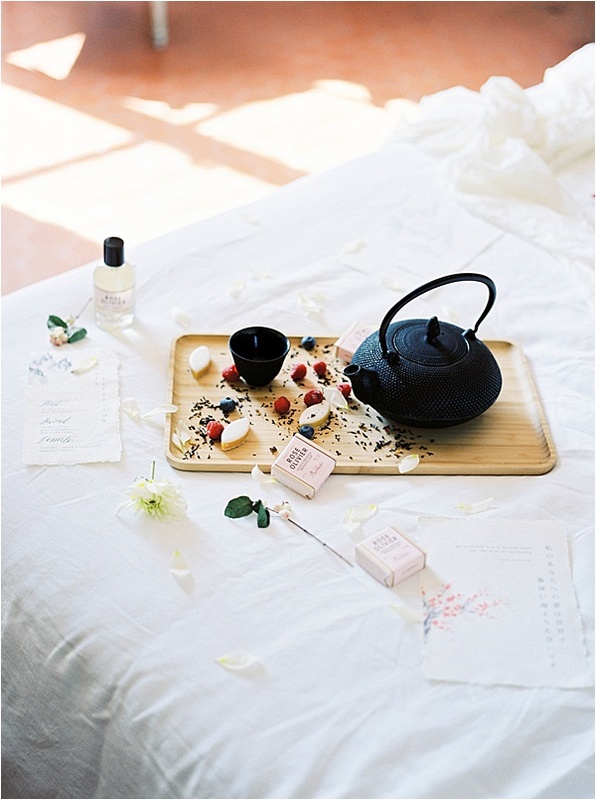 This editorial captured by Iliasse Photography, was created to suggest the elegance, the simplicity and the delicacy of a Japanese style, like the Sakura flowers. Despinoy Wedding & Event and Iliasse Photography worked together on the design and the atmosphere in La Bastide de Torursainte, a beautiful historical monument in Provence in South of France from the XVIII century. The theme, was chosen for the simplicity of the Japanese art and culture and they suggested a tea bar (in reference to tea ceremony). 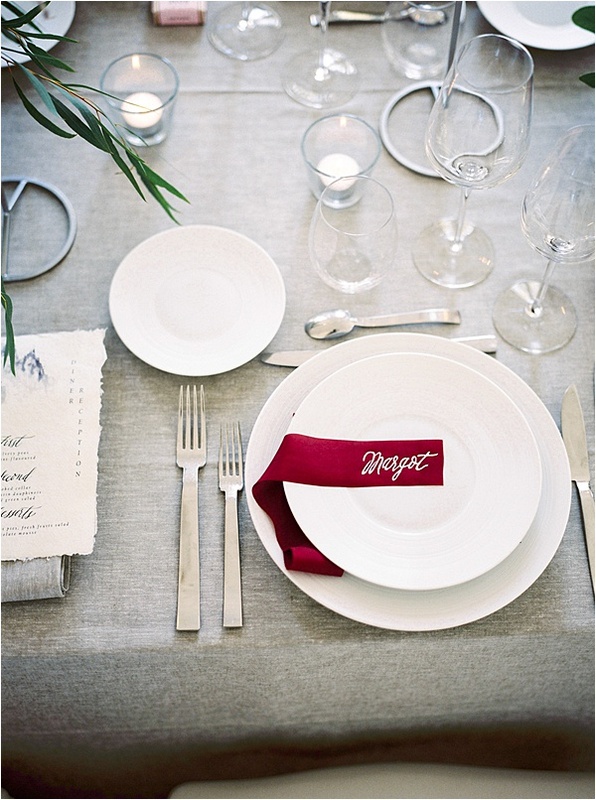 The table was set with natural grey linens for tablecloth to create a graphic canvas for the elegant crockery from Options Rentals. The burgundy ribbon, calligraphed by Callyane with Silk and Willow Ribbons, was gently place on the plate as the guest name. 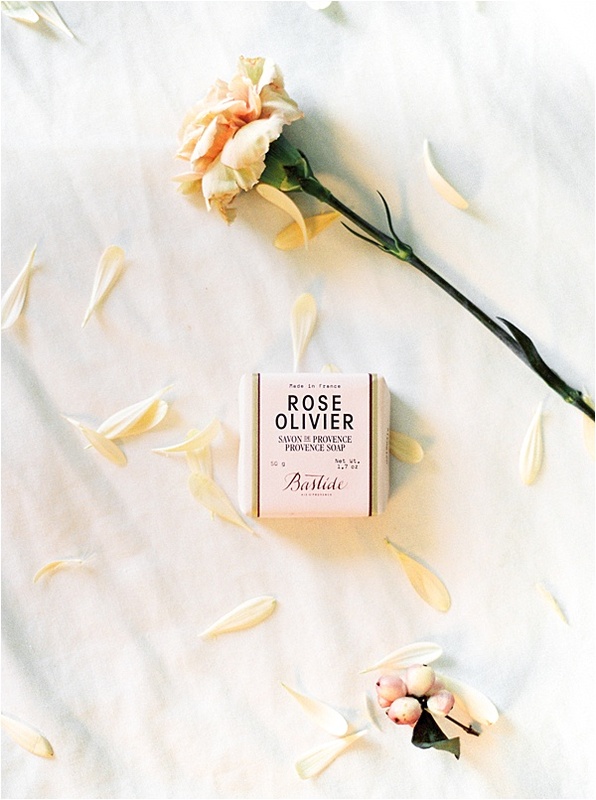 And for favors, each guest receive a handmade soap from Bastide made in the South of France, in Aix-en-Provence. A traditional savoir-faire! 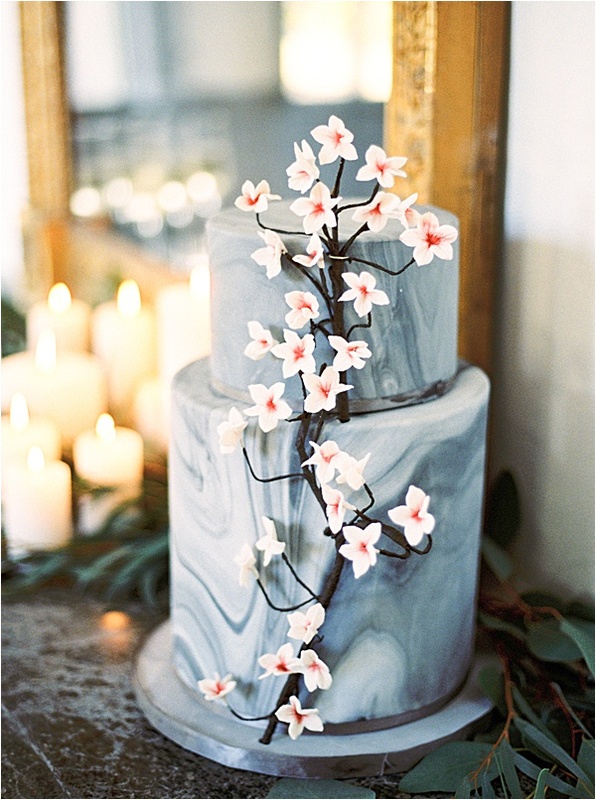 On the old chimney was place a marble cake with little pink flower representing Sakura flowers, made by Make Me a Cake, cake designer. Les Fleurs De Ninon was inspired from the ikebana art for the inspiration of flower, something ethereal and graphic to filled the middle of a long table. 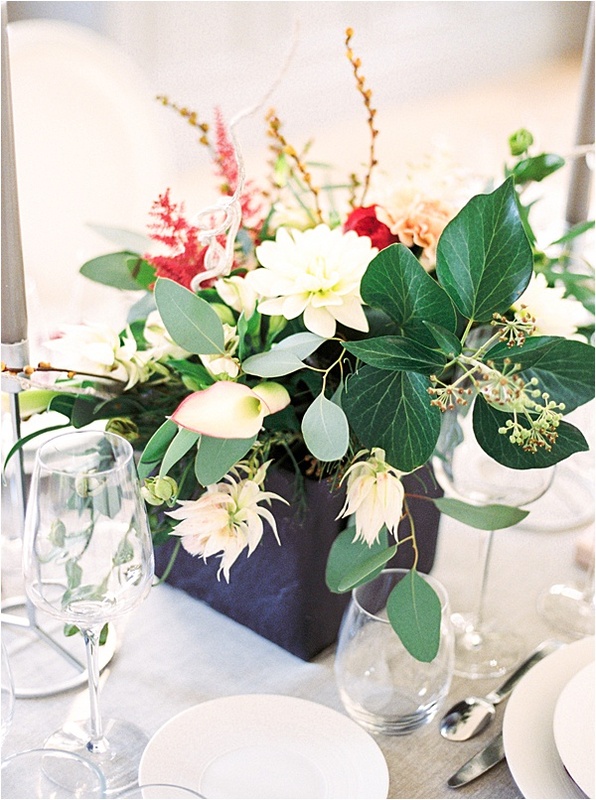 The floral arrangement was made of: astilbe flowers, little protea, white wood branches, eucalyptus, arum lily, dahlia and carnation. 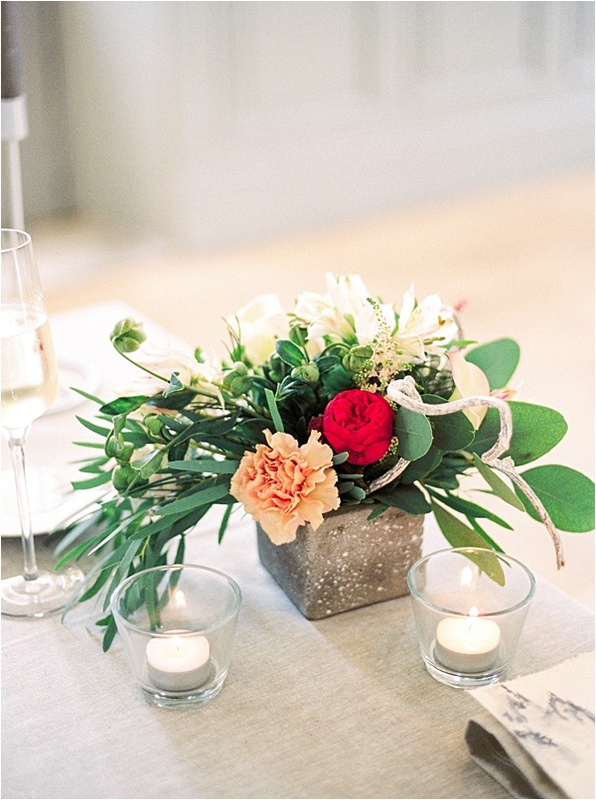 The colour palette was burgundy, light pink, light grey, dark grey and white. The burgundy was the strong colour among all the grey colours of the Japan calligraphy. 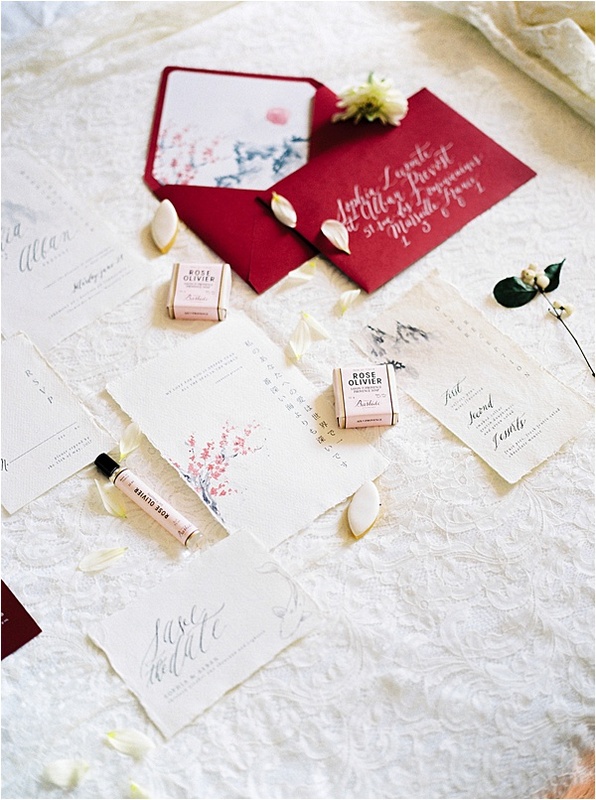 The stationery, was made by Callyane with a hand calligraphy, on a handmade paper. She chose the illustration of a koï fish and mountain to remind of the old Japan paintings known as ukiyo-e. 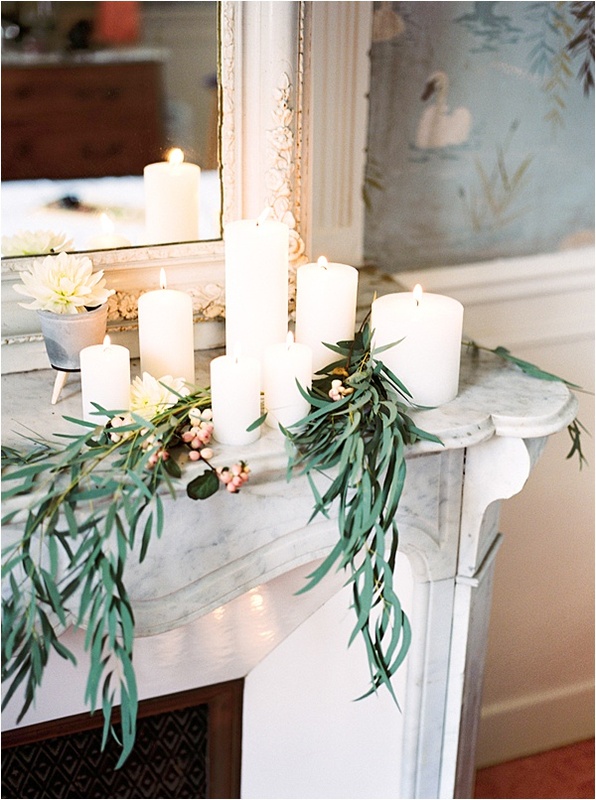 The boudoir photo was taken in the main room of the venue, intimate and soft design. 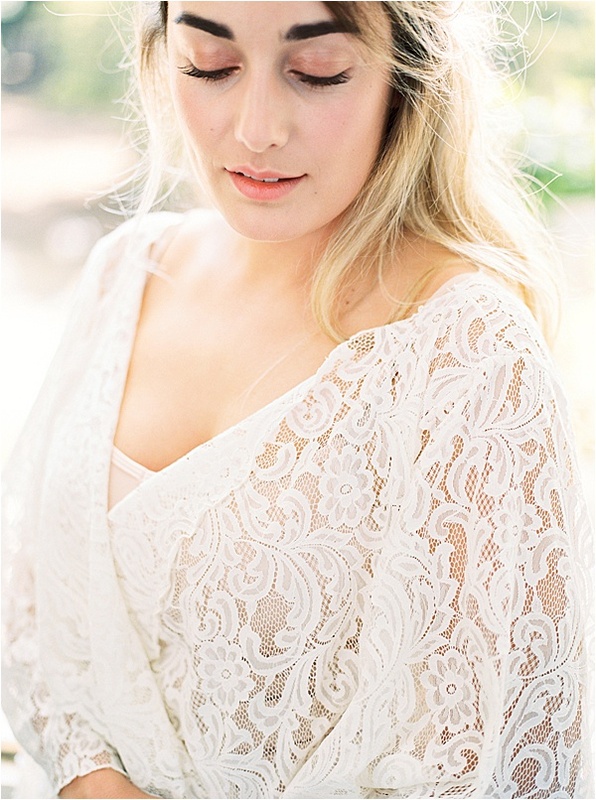 Hair and makeup was soft and natural, made by Delphine Ruffini with a long lace kimono made by Aurelie Mey. For the two others dresses, the makeup and hair was in different style according to the wedding dress. 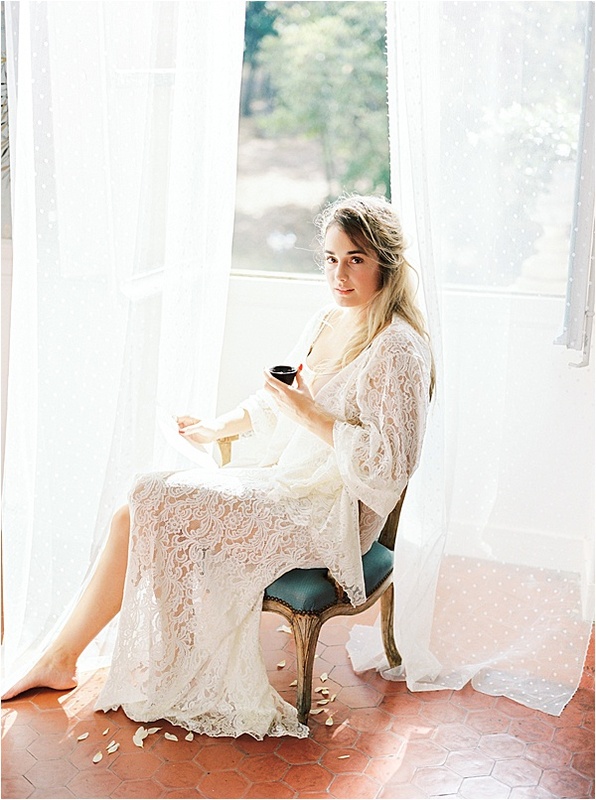 The bride wore two custom dresses from Aurelie Mey for two differents moments of the wedding day. 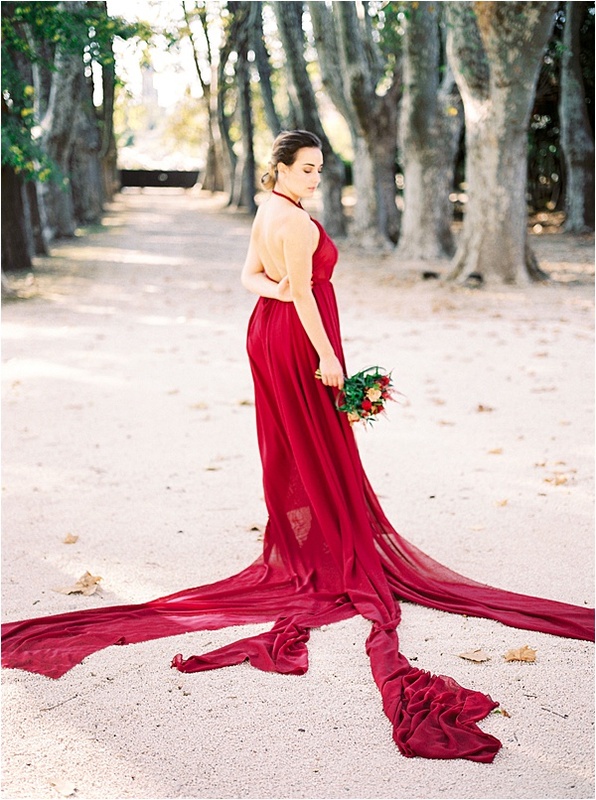 She chose to create a flowery wedding gown made of velvet and light pink fabric. 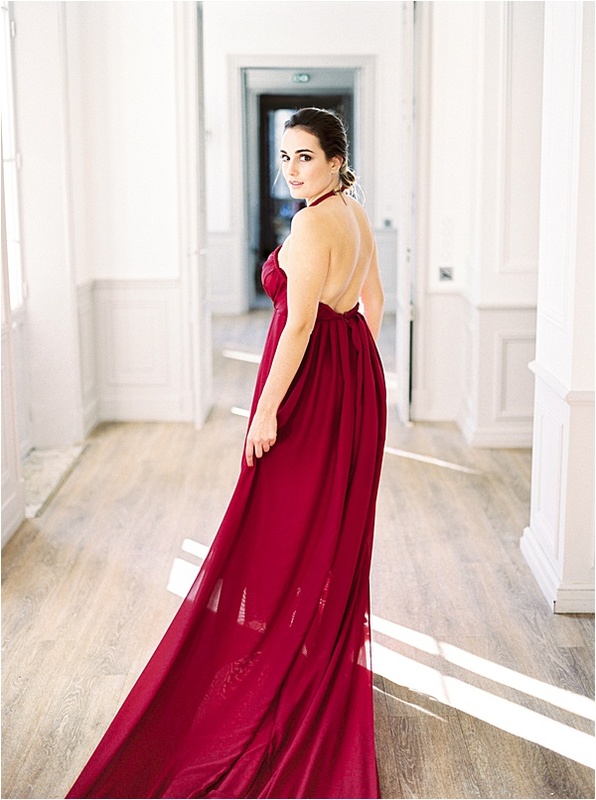 The second one was designed for the night, in burgundy colour and light silk, in asymmetric form; for a Couture style. 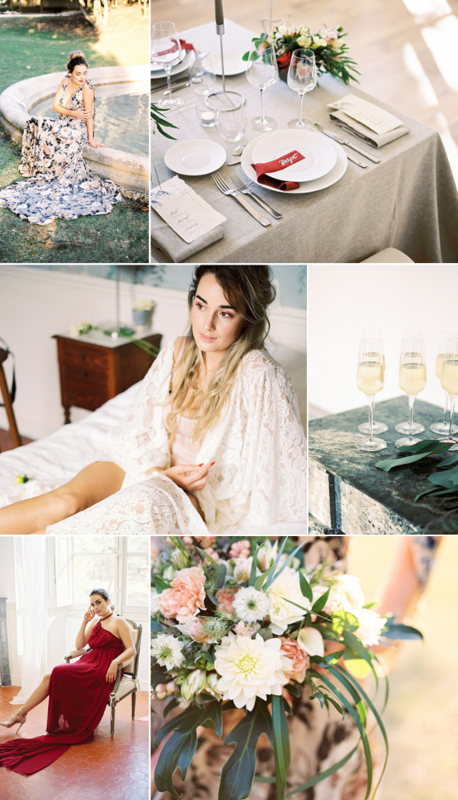 Photographer: Iliasse | Planner: Despinoy Wedding & Event | Florist: Les fleurs de Ninon | Venue: La Bastide de Toursainte | Wedding Dress: Aurélie Mey | Stationery: Callyane | Hair and Make Up: Delphine Ruffini | Hire: Options | Cakes: Make me a cake | Favours: Bastide Aix-en-Provence | Accessories: Silk and Willow | Model: Roselys R.